LONDON -- Prince William has told a two-day international wildlife protection conference that he could not face his children if his generation allows elephants, tigers and other species to become extinct. "It's heartbreaking to think that by the time my children, George, Charlotte and Louis are in their 20s, elephants, rhinos and tigers might well be extinct in the wild," he told the Illegal Wildlife Trade Conference hosted by the British government. 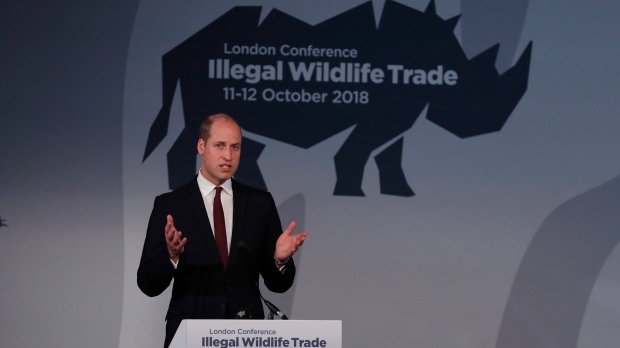 William told political leaders and businesses and conservation groups in the keynote speech Thursday that it makes economic sense to protect wildlife from criminal networks targeting animals in the wild. British officials also announced an "Ivory Alliance 2024" initiative designed to lessen demand for ivory products, strengthen enforcement of existing bans and toughen anti-poaching legislation.